Children of Time by Adrian Tchaikovsky really messes with your sense of life spans and what it means to be old. Starting this book I only knew two main things about it, there are spiders in this book, and it won the Arthur C. Clarke Award a few years ago against some really difficult competition. After reading the synopsis, before starting the book, I was excited because I love these "last remnant of humanity" type books. When I opened the book up and read the first 30 or so pages, I had seriously mixed thoughts. I had a hard time connecting to any of the characters and even though I knew where the book was heading, I wasn't sure if it was something I'd particularly care for. Luckily, I kept reading because I realized that Tchaikovsky, even in the first chapter or two, has really done his research, and it can only get better. I was definitely right about the research aspect of this book as the book progresses this idea of "seeding a planet with new life, becoming a god for a new species," really hooked me. Of course, the plan was for the monkeys to evolve over time but they all died during the entrance to the planet. What didn't die in the firey ball falling to the ground were the spiders on board. With the help of a super virus that speeds intellectual growth, the spiders become the new advanced species on the planet. I was all about this part of the book and the imagery that the spiders give the reader throughout each passage is amazing. The other important part of this novel is that the descendants of humanity arrive at this planet many years later looking for a new world to colonize. Stuck on a "space ark" things are getting a little cramped, even though the majority of the crew are in stasis sleep. In Tchaikovsky's novel, space traveling is super slow, so people have to be put to sleep in order to be reawakened at their destination. I love this mode of travel in science fiction, it never fails to capture my interests, and this book took that idea to new heights because different crew members are woken up at different times. The question then begins, what is age? Is it the amount of time outside of the stasis pod or is it the total culmination of all your years? We mostly follow one classicist as he uses his knowledge of "the old empire" to figure out clues that were left behind. While reading this book I absolutely loved the spider perspectives and how their society functioned. It was really interesting to see them tackle the same issues that we've tackled in our society and cultures over the generations but with an arachnid focus. It is obvious that Tchaikovsky studied zoology and psychology because those two things represent the main focus of this novel. The psychology part comes into play when the space ark can't land on the planet because the original creator of the planet is still circling the planet as the "god" of the spiders. When many generations have to be born on a space ark, the psychological damage this takes on the crew is immense. I really liked this book, I was always fascinated by some new scientific or zoological explanation. I connected to the spiders much more than the humans, in fact, I had a hard time liking the human characters. Like with some science fiction books, sometimes the characterization is left behind in favor of the science, and I felt like we didn't get enough scenes with the humans before they were put back to sleep. The aging of the characters and the fact they go to sleep so often causes a slight disturbance in our ability to really care for the characters in a way that connects us to the story. The exact opposite can be said for the spiders though, as their trials and struggles made us care about them much more. A well-written and likable book that has strong zoological research and an amazing premise only falters slightly because humanity's last survivors and point of view character just wasn't as fleshed out as the spiders. An incredibly strong world-building book with a solid 4.5 rating overall. 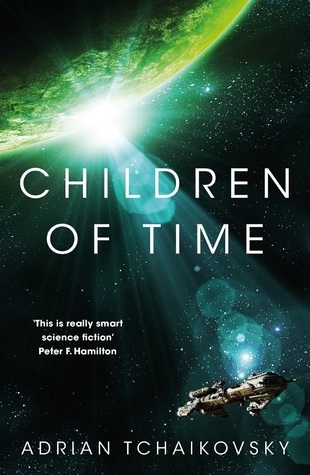 Sign into Goodreads to see if any of your friends have read Children of Time. GREAT review. I don't often put stuff on my wish list based on a review, but I did this time. Nice job. Thank you for the compliment, I hope you enjoy the book.